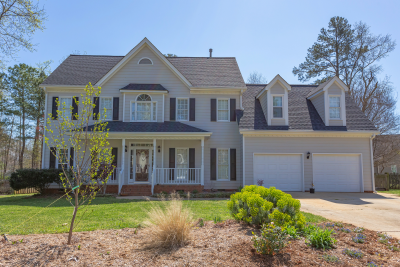 Gorgeous and Move-in Ready in Highly Desired Heatherwoods of Garner! This one has been COMPLETELY UPDATED! Four Bedrooms/Three and a Half Baths! Gleaming HWD floors! First Floor Guest Suite has been updated and is swoonworthy! Kitchen has been completely updated and boast new appliances/new custom lighting/backsplash/and new custom quartzite countertops! Kitchen opens to Family Rm with fireplace! Formal Living Rm AND Formal Dining Rm just off Foyer. Master RETREAT w/sitting area! Master Ba updated Dec 2018! Large secondary bedrooms! Unfin third floor! NEW Roof 2016! New HVAC 2012! New Paint Fall 2018! Built in Gun Safe. Amazing FENCED Flat lot with Garden Bed! Flagstone Firepit added in 2015! Large storage Shed! Exterior Painted 2015! Truly all you need to do is MOVE IN! Just minutes to everything! Less than 5 minutes to Lake Benson, New YMCA, Grocery, Shopping! Less than 10 minutes to White Oak and 40 access!